Everyone was looking apprehensive in government house this evening after Governor Peter Obi arrived from a trouble shooting trip to Abuja and Lagos over the vexed N255 million scam that has refused to go away despite Obi's desperate efforts to bribe and blackmail his way out of it. Ukpakareports.com learnt from our sources in Gov. Obi's office that the Governor hurriedly left Awka yesterday morning for police headquarters in Abuja aboard Arik morning flight from Enugu, after being tipped off that police has intensified investigation on the matter. By 4.40pm, Obi was back to Nnamdi Azikiwe airport Abuja for another Arik Air flight to Lagos for an early meeting at Fidelity bank head office at 2 Kofo Abayomi Street in Victoria Island. Obi who was at the bank for over two hours this morning to falsify further documents needed to cover up the N255 million fraud, arrived through the back door and left through the same back door. Fidelity had provided an advance payment guarantee with which local government cheques were drawn after the money was discovered, to disguise the fact that the money was security vote being laundered monthly by Peter Obi. Obi, one of Nigeria's most fraudulent governors ever is given to covering up his tracks by diversionary presentation of himself as a Saint while every one else is labeled a sinner and a treasury looter by him. Obi pockets all of the monthly security votes, pockets N385 million interest monthly on Anambra funds in various banks, pockets 10% on all contracts he awards and takes his cuts from local government allocation monthly. He previously admitted the 10% extortion of contractors but claims he ploughed it back into some projects. He may have made a great success out of managing his personal businesses but managing Anambra State is definitely not one of his greatest strengths. 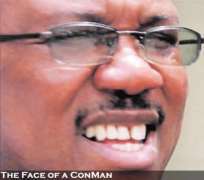 Saint Peter Obi a deluded hypocrite, has at various functions, castigated traditional rulers that 75% of those that get conferred with chieftaincy titles are criminals and castigated Bishops that 75% of those they confer Knighthoods are criminals. Where he gets this statistics in line with all other statistics that he is fond of bandying about beats me. Even his brother Governors were not left out when he charged them with wasting taxpayers monies buying bullet proof jeeps and spending the rest entertaining young girls. The chickens are fast coming home to roost for Obi now. At least three of Obi's serving Commissioners are now complaining openly about ongoing frauds in their ministries for which only Obi can fully account for. As a governor, Peter Obi has created a world record of being the first man in the whole planet to govern any state on his own alone and having lost his points man in the House, the Deputy Speaker Hon. Afam Obi, Peter Obi has resorted to bribing Hon. Simon Ohajianya, a member of the Anambra State House, representing Federal House ousted Chuma Nzeribe's Ihiala 1 Constituency to claim that the State House of Assembly gave the 'prudent governor', a final over the 255 million scandal that he is enmeshed in. Hon. Afam Obi found out that Obi is a hypocrite and decided to tow the path of honour. The Governor brought out Ohajianya in reaction to the press conference called by the six members of the Anambra House yesterday saying they had not cleared nor indicted Gov. Obi of stealing Anambra State funds. Their press conference had been chaired by Hon. Njidike Ezeigwe and attended by Hons. Ikenna Amaechi, Gloria Chukwuka, Nicky Ugochukwu, Lilian Okosi and J.C Okeke. Gov. Obi's political appointees are fuming that the governor keeps everyone in the dark about state matters, sidelining key appointees and humiliating everyone in the process. Last Friday witnessed a public humiliation for his Chief Protocol Officer by the name of Ngozi whom Obi gathered all his convoy staff together before humiliating her in front of them. Obi's frantic efforts at covering up his tracks has to do with the fact that PDP hierarchy have become very much interested in getting to the root of this scam. EFCC have now also commenced their investigation on the matter with Fidelity bank coming under severe searchlight as a result. Peter's boast that he 'settled' House members had angered them and has led to them being ridiculed by the public and what is now playing out is partly to do with these Honourable members clearing their good names through being seen as living up to the oaths of office taken at their inauguration. Ukpakareports.com gathers that Obi sees his governorship tenure as a war situation and decided a long time ago that the main tool to employ will be propaganda and blackmail. His Chief Propagandist Val Obienyem is hardly seen anywhere these days as he has been withdrawn from Obi's convoy to the trenches from where he and Obi falsify stories against innocent Anambrarians and these stories are fired off by the minute via the internet, using several fake names. The fact remains that any incoming governor next year will have to do a lot of cleansing because Obi has desecrated the office of Governor of Anambra State.